The days of browsing car showrooms for your new motor has not ended yet, but the landscape has shifted significantly over the past few years and car showrooms of tomorrow could exist almost entirely online, according to a new report. Automotive digital marketing analysts Sophus3 have released their quarterly summary on the latest research into how consumers are accessing information from major car brands and the device of choice is clearly mobile phone technology. The only European country to have a slight majority in ‘conventional devices’ is Germany with 51% still preferring laptops and PCs, but at 51%, it is a narrow majority that will soon become a minority. The UK and Spain lead the way with mobile use for accessing car websites and though the UK leads the way in tablet use for the same research, this is on the decline as tablets gradually become less relevant due to the capabilities of Smartphones. Few doubted the future lay in mobile technology but it is the speed of the change that has perhaps surprised the automotive industry. 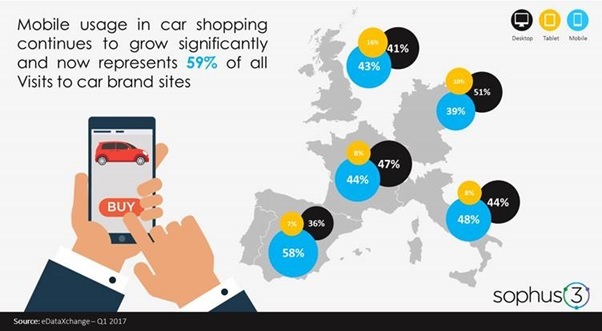 Mobile usage for car shopping in the UK continues to grow at a rate of knots and now represents 59% of all visits to car brand sites. Consumers can take a virtual tour of the online showroom and even take virtual test drives as the industry continues to adapt to the demands of the customer base. Sophus3 chairman Marcus Hodgkinson said: “Just a decade ago, the average new car buyer visited six dealers before buying their car. This has now dropped to less than two visits. “At the same time, the proportion of visitors who use the internet as their primary pre-purchase research channel has risen to above 90 per cent which is a massive shift away from the traditional consumer journey of yesterday. Consumers’ trust in the automotive industry is high with warranties and guarantees of quality standard with all new purchases and after accessing the brand’s online offerings, there is a wealth of expert opinion pieces and a raft of reviews easily accessible. Continues Hodgkinson: “Our digital data can provide an effective window on the consumer journey for the auto brands who are provided with information as to where the consumers shifts and demands are moving. There was an initial reluctance to embrace technology, perhaps believing that people would always favour physical over virtual but that’s not the case. Mobile technology is clearly king and while car showrooms won’t disappear entirely, they are likely to become less relevant for some car buyers as time goes on.